Creating worlds for fantasy and science fiction is a topic beloved by many. And, of course, there is plenty of excellent advice available online. Two of my favorites are Brandon Sanderson’s “Rules for Magic” and this series by the excellent Brenda Clough. There are even dedicated tools you can use, such as the highly-regarded World Anvil. But imagining an entire world is no easy task. For all the great resources available, writers often struggle. In this post, drawing on examples from expert authors, I’ll provide three tips for setting up a fantasy world that is both imaginative and unique. World-building can be great fun. It can also be a rabbit hole. Many people spend endless hours defining every nook and nuance of their world—history, climate, geography, sentient races, religions, magic, technology. But if you want to write fantasy stories, you need to put the story first. Put your focus on the primary elements of story. Who are your characters? What are their goals? What are the obstacles to those goals? How will they seek to overcome those obstacles? Let all your world building efforts be driven by those questions. 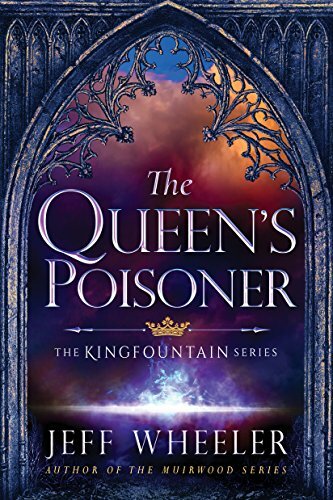 Take for example The Queen’s Poisoner by popular author Jeff Wheeler. The story takes place in a pretty standard medieval-style world (with a few unique and intriguing elements). But the focus is first and foremost on the characters—as we follow our young hero Owen through the tribulations of being held hostage in the castle of a tyrant king. The history, politics, and other background information are revealed gradually and always in terms of how they relate to the dramatic story. Or consider the massive and massively popular The Name of the Wind. 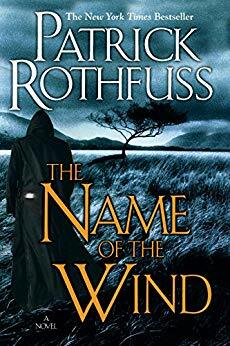 Patrick Rothfuss constructs a complex and richly-detailed fantasy world. But again, the setting is only gradually revealed in the midst of dramatic action. In this case, we are presented with multiple narratives—the first, a framing device that introduces the hero, then multiple sequential stories as the protagonist relates his history to the “Chronicler.” This is also a truly epic example of story construction. But the best fantasy worlds have something that makes them unique and special. In The Name of the Wind, we find (among other things) a complex set of “arcanist arts” (including Sympathy, Sygaldry, Alchemy, and Naming) which function according to precise scientific laws. Or take NK Jemison’s award-winning The Broken Earth Trilogy. In Book 1, The Fifth Season, we meet the orogenes, a unique kind of humans with the power to sense and tap the tectonic forces of the Earth. These books might best be called science-fantasy, since the orogenes’ powers are linked to a biological explanation. But the author’s depictions of how these powers feel and are experienced are nonetheless fantastic. In world-building for my own novel, Cloak of the Two Winds, I tried to imagine one thing to make the setting unique. The world, Glimnodd, is a place where arcane arts have been practiced for ages. Part of the legacy of all this witchery is that magic winds blow over the seas, changing water to ice or ice to water. Yes, I came up with that on my own! Fantasy is escapist literature, and I’m all for it. But unless a story is relevant to readers, they won’t care about it. And for a fantasy story to be relevant, the experience of the world and the characters must be relatable. In other words: What about the current state of our world does this fantasy world portray? I learned this lesson when a friend read an early draft of Cloak of the Two Winds. 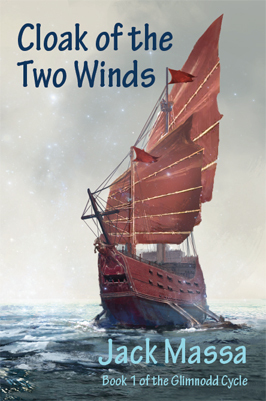 The freezewind and meltwind in the story were created in ancient times as a kind of pressure-release. So much magic and sorcery were practiced that their cumulative effects had plunged the world into chaos. To keep the world in balance, the two winds now bleed off excess magic energy. In the story, the Cloak of the title can control these magic winds. But it has been stolen and is being misused by a mad sorcerer intent on bringing the world back to chaos. What about all that is relatable to our world? I didn’t realize it myself until a friend referred to the story as involving a “climate emergency.” In our world, overpopulation and technology are threatening us with chaos. Perhaps technology, wisely applied, will help us restore the balance. 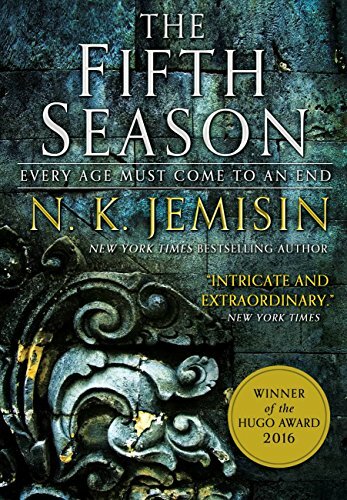 As another example, consider Jemison’s The Fifth Season. The treatment of the orogenes by the dominant humans is relentlessly horrible—and depicts how oppressed people are and have been treated throughout history. The depiction is powerful and brutal. Jemison herself discusses this in a thread on her Twitter feed. So, if fantasy writing is your thing, consider these three tips to make your world-building and your story as great as they can be. 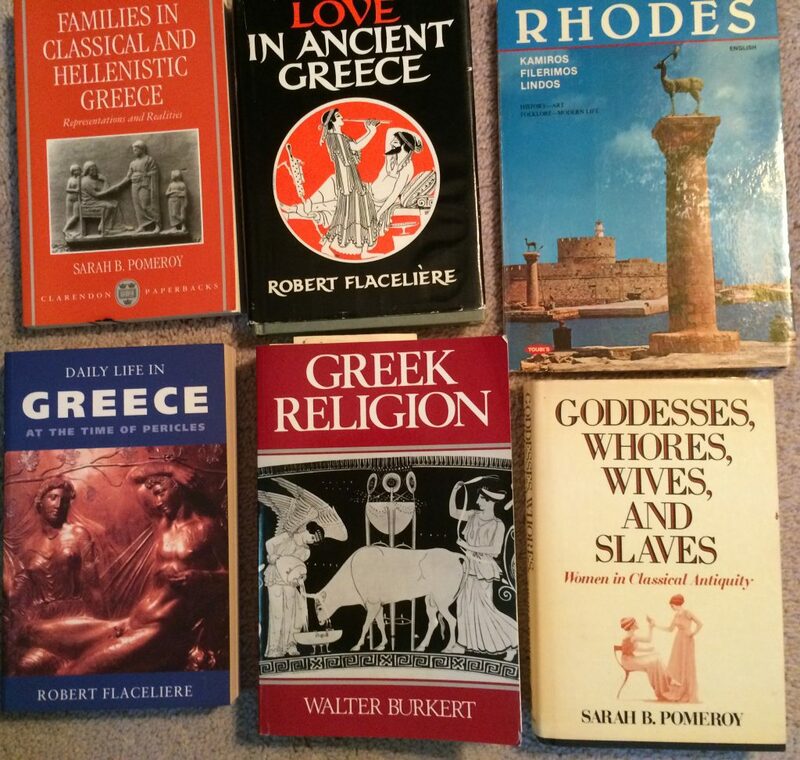 When I first started writing the Conjurer of Rhodes series , I renewed my acquaintance with the ancient Greek gods and goddesses. Early in the Conjurer books the protagonist Korax recklessly summons the god Dionysus to help him win a singing contest. This leads Korax to a world of trouble, and led me to research the god of wine and frenzy. Dionysus was the son of Zeus and a mortal princess, Semele. 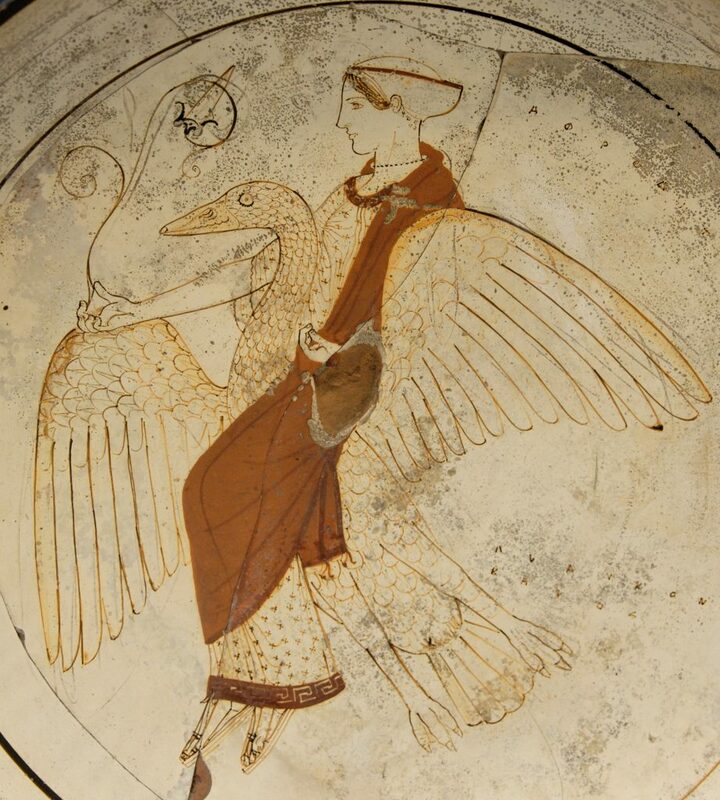 According to one version of the myth, the Goddess Hera, disguised as an old woman, paid a visit to Semele and convinced her to demand that her lover show himself in his true aspect. 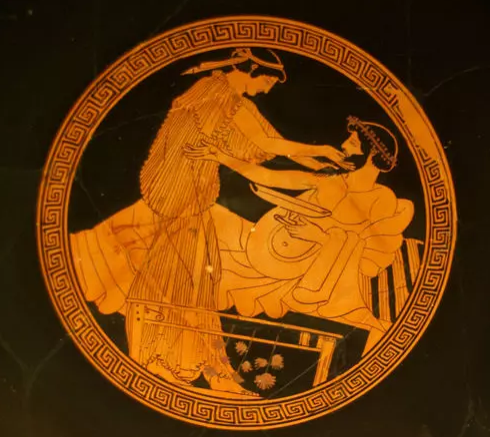 When Zeus swore an oath to give Semele anything she wished for, he was forced to comply. Unfortunately, mortals cannot gaze on the full glory of the gods, and poor Semele was incinerated. 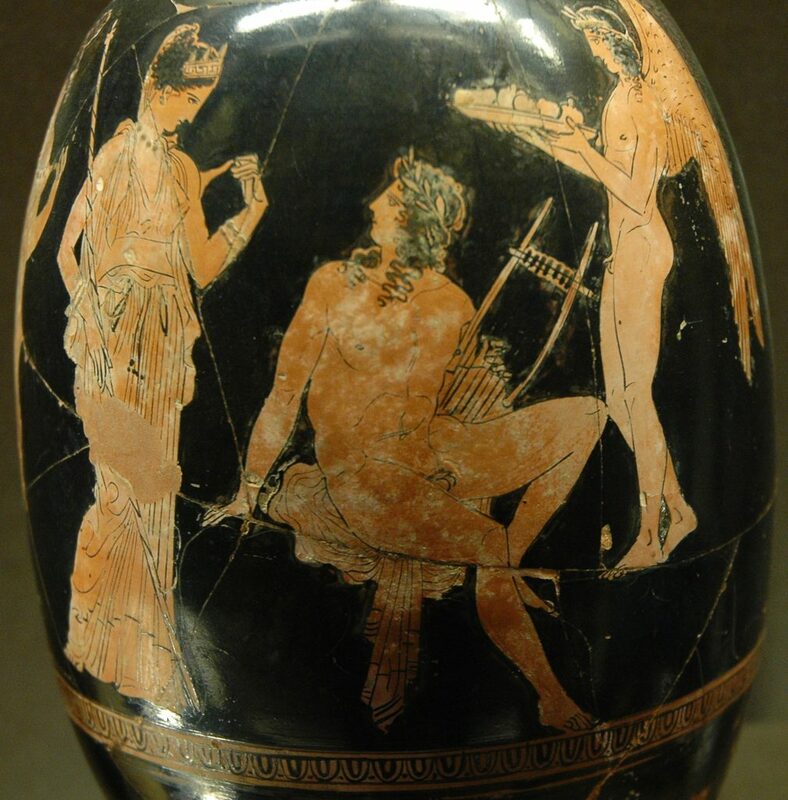 Zeus rescued the unborn Dionysus and sewed the child into his thigh. Dionysus was born a few months later and is thus called “twice-born.” Oh, and no need to mourn for Semele. When Dionysus grew up, he took a journey to the Underworld, rescued the shade of his mother, and brought her to Olympus. 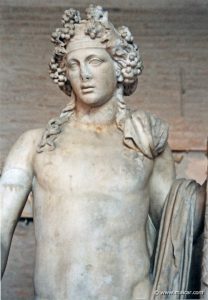 The fact that Dionysus was incubated close to the generative organs of the King of the Gods doubtless reflects his later association with fertility and the generation of life. The Athenians celebrated his festival in the Spring, to mark the end of winter and the harvesting of new crops. This Great Dionysia was a time of singing, dancing, and theater, and Dionysus was considered the god of plays and players. 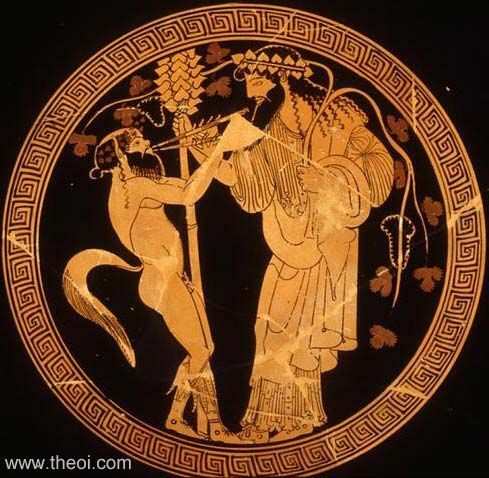 The most famous appearance of Dionysus in Greek literature is, of course, in Euripides’ The Bacchae. In mythology the Bacchae, or maenads, were female worshippers of Dinoysus who followed the god through the hills, intoxicated and ecstatic. In Euripides’ play, the rulers of Thebes are not so welcoming to this divine madness. Pentheus the king outlaws the worship of Dionysius and actually imprisons the god, whom he takes for a mortal acolyte. The following poem recounts the story of Dionysus and sees a glimmer of relevance to our own times. You poets of the sacred songs. Born of mortal, Theban princess. To gaze on god she insisted. Burned her flesh and bones to ashes. Immortal child born of death. People circling dumb with fear. Will your call awake our cities? Bereft are they who scorn the gods. You can learn more about the Conjurer of Rhodes Books here or find Book 1 on Amazon. This month we wrap up our series on conveying backstory in fiction without losing dramatic momentum. Action by the character to deal with the obstacle. Resolution, success or failure, leaving the character closer or farther from their goal. Emotion. To identify with your characters, readers must feel for them. Showing, the crucial method of presenting the story. Again, we’re defining backstory as all of the background information a writer needs to communicate so that readers will understand a scene. This might include descriptions of settings, the characters’ past experiences, motives and psychology, and past events that are not shown on stage. The problem we’re exploring is how a writer can convey all of the backstory without losing the reader’s interest in the immediacy of the drama. This is a technique that is often employed but not often discussed. As a reader, once you start noticing it, you’ll see it is used often. Basically, the author starts a scene in the present, ideally with an emotional hook to engage the reader. Then after a few lines, the narrative skips back to reveal backstory. This is not a flashback, just bits of exposition sprinkled in, usually from the point of view of the character that we are following in the scene. Essentially, the writer drops a scene in the reader’s lap, gets them involved, then steps back here and there to explain the backstory. Science fiction and Fantasy typically require the author to cover a lot of backstory—specifically, details about the world in which the story is set and how it differs from our world. This example is from Kim Stanley Robinson’s Red Mars, an epic, award-winning novel about the colonization of the Mars. The scene takes place on one of the first colony ships, right after launching. One hundred carefully-selected colonists are celebrating. In Torus D’s dining hall, they mingled in a kind of cocktail party, celebrating the departure … Maya wandered about, sipping freely from a mug of champagne, feeling slightly unreal and extremely happy, a mix that reminded her of her wedding reception many years before. Hopefully, this marriage would go better than that one had, she thought, because this one was going to last forever … Maya turned down an offered refill, feeling giddy enough. 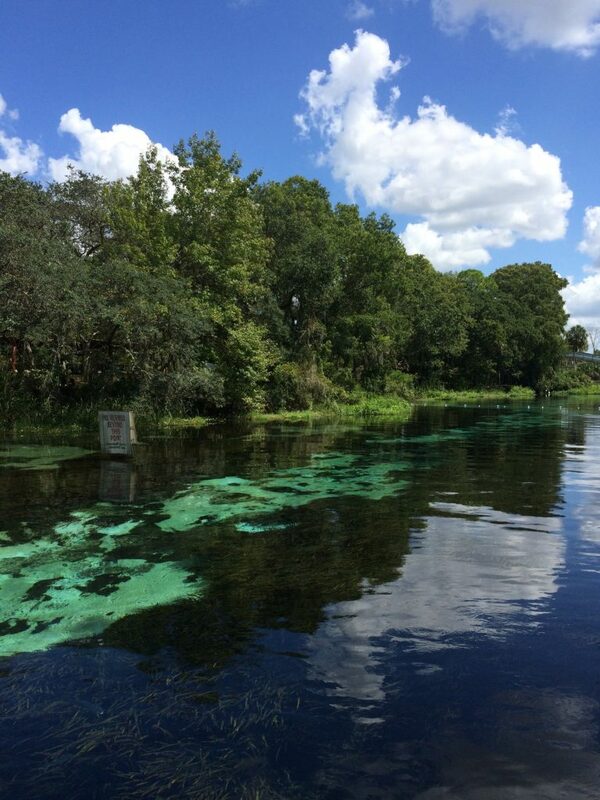 Besides, this was work. She was co-mayor of this village, so to speak, responsible for group dynamics, which were bound to get complex. Antarctic habits kicked in even at this moment of triumph, and she listened and watched like an anthropologist, or a spy. This passage, part of a longer scene, drops us into the middle of the action. We’re in the viewpoint of the psychologist Maya, and each action and snippet of dialog is followed with her reflections— which provide much backstory about Maya, her colleagues, and the mission. We learn about the colonists and how they were selected. There are different international contingents, and we learn something of the character and behaviors of the Russian contingent in particular. We learn Maya’s role, and her concerns about it. Notice the comparison to a wedding reception. This skillfully connects a context with which the reader is totally unfamiliar (a spaceship community) with something very familiar (a wedding party) which has common emotional associations. We also find out that Maya’s marriage did not last, and that this group community has to last forever. For these folks, there is no coming back from Mars. Finally, the comment about ‘the rational society dreamed of by the Enlightenment’ links this story of a future time with an earlier period of human history. This reflection on big-picture philosophical/historical ideas is something that quality science fiction can do in a way no other kind of fiction can. Using this method in your writing takes some practice. Begin by searching out good examples in writers whom you admire, and analyze them carefully. Start the scene with an emotional hook. Engage the reader on the feeling level. Be clear who the viewpoint character is. See the scene from their point of view and note their responses to each bit. As these responses arise, describe them and link them to the necessary backstory that the reader needs to appreciate what is going on. Keep the chunks of backstory small. Finish the backstory exposition no later than halfway through the scene. Then write the rest of the scene—like all of your scenes—to show conflict, action and resolution. This concludes the series on conveying backstory in fiction. I would love to know what you think about this and previous posts. 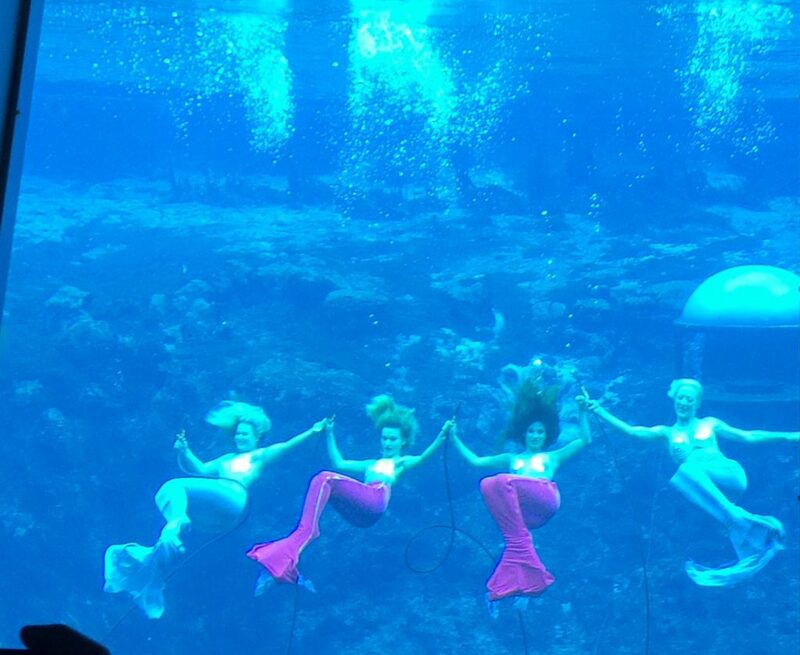 Returning from our mermaid adventure last month, we are back to talking about the craft of fiction. In previous posts in this series, we’ve examined different ways that successful fiction writers present backstory while maintaining dramatic momentum. We’re defining backstory as all of the background information a writer needs to communicate so that the reader will understand a scene. This might include descriptions of settings, the characters’ past experiences, motives and psychology, and past events that are not shown on stage. We’re all familiar with scenes where a character learns some backstory by hearing it from another character. When done well, this is a seamless and effective way to convey information. But you have to be careful. Done poorly, this technique can easily seem contrived, the dialogue ‘stagy.’ In science fiction writing, we are warned to avoid the “As we all know, Jim” syndrome. Never, never start a speech with “As we all know.” If we all know it, why are you saying it!? In this example from Parker’s , Death in Paradise, Jesse Stone is chief of police for a small town in Massachusetts. He’s investigating the murder of a teenage girl, and it’s led him to meet Lily, the principal of the high school. They’ve covered the details of the case, and now the conversation turns personal. Lily crossed her legs the other way. Jesse waited. In just 130 words here we get a lot of backstory. We learn not only about Jesse’s history (which readers who have read this far know some of already), but also a bit of Lily’s. In terms of story-craft, notice how the exposition comes up in a scene that is mainly about something else. Suddenly, it shifts gears and moves the characters’ personal stories along. Also, it not only tells some of Jesse’s history, but it shows us how he sees himself and presents himself to others: world weary, straight and direct, brutally honest about himself. Significantly, the prose style mirrors these characteristics, and is also extremely easy to read. Secondly, present the dialogue in short chunks, not long speeches. Finally, make the disclosure part of an emotionally-engaging scene. Your readers must feel for the characters or they won’t care about the backstory. Next time, we will wrap up this series by discussing the last of our Five Techniques, one that is frequently used but rarely discussed: Sprinkling Backstory into a Scene. 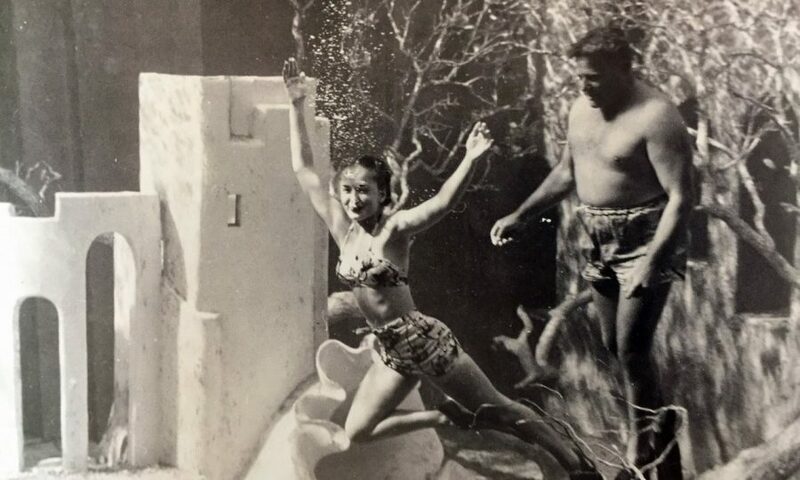 This is the fourth in a series of posts (beginning here) explaining five ways that successful fiction writers present backstory while maintaining dramatic momentum. For our purposes, we’re defining backstory as all of the background information a writer needs to communicate so that the reader will understand a scene. This might include descriptions of settings, the characters’ past experiences, motives and psychology, and past events that are not shown on stage. In real life, we all spend time thinking about our problems. Your characters can do the same. In this method, the author writes a scene in which—rather than two or more characters interacting—a single character reflects. The scene might be written in first person (internal monologue) or third person, but it is an immediate scene. That is, we are present with the character, and the character takes some actions along the way. But the focus of the scene is on the character’s reflections: on where they are in the story, how they got here, what problems they face, what they might do about them. This technique is a very efficient way to convey lots of backstory economically. This passage is from Grisham’s best-selling crime thriller, The Client. Set in Chapter 2, the scene presents lots of backstory setting up the rest of the novel. We’re following a New Orleans criminal named Barry the Blade. Expecting to meet his lawyer (Jerome) for dinner, he’s just phoned the lawyer’s office and been told Jerome left the office at 9 AM and has not been seen since. The Blade slammed the phone down and stormed through the hallway, then caught himself and began to strut as he neared the tables and the faces. The restaurant was beginning to fill. It was almost five.He just wanted a few drinks and then a nice dinner with his lawyer so they could talk about his mess. Just drinks and dinner, that’s all. The Feds were watching, and listening. Jerome was paranoid, and just last week told Barry he thought they had wired his law office. 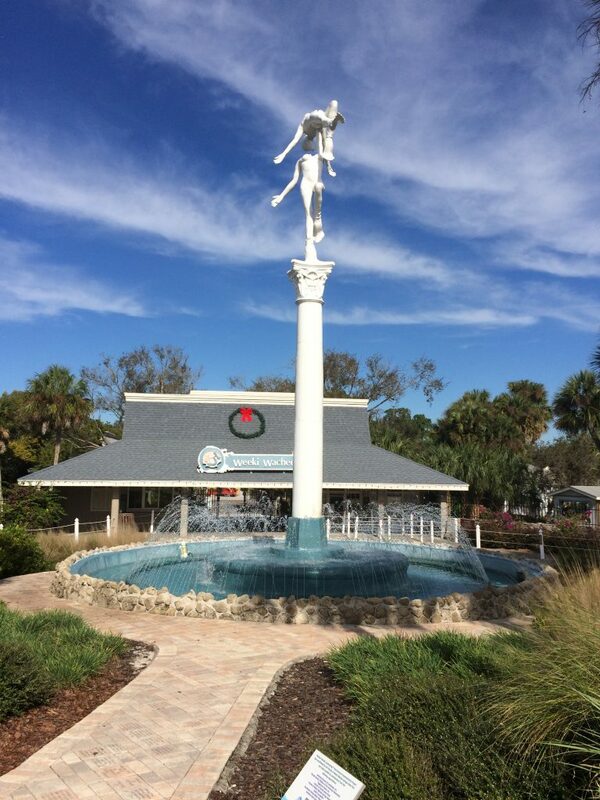 So they would meet here and have a nice meal without worrying about eavesdroppers and bugging devices. The scene goes after on the above, but in just these 200 words we learn a lot. We get a clear picture of Barry, conveyed both by how he acts in public and how he thinks. Notice in the first paragraph how he begins to “storm,” then catches himself and resumes his characteristic “strut.” He is emotional, but carefully controls what he shows to the world. Notice also the rapid-fire summary of his thoughts in the second and third paragraphs. This conveys not only the information content of the backstory, but Barry’s emotional state in thinking about it. Set up a scene where a character can think about their problems. This might be while taking a walk, working out, taking a shower, waiting for a bus—any situation where a person might spend time reflecting. Summarize the backstory from the character’s point of view. Why are they thinking about his? How will they be effected? Keep it short. Info dumps are only deleterious when they’re long. Then they interrupt narrative tension and cause readers to yawn. So break up the character’s reflections with present actions, keeping the reflective passages brief. Again, this technique of building scenes where the characters are reflecting can be very effective in conveying a lot of backstory information in a short space. Next time, we’ll look at the 4th of our 5 Ways to Show the Backstory, that tried and true technique where characters tell each other the backstory. Following up on the previous two posts (see this post for the start), here is the second of five ways a writer can convey backstory while maintaining dramatic momentum. Reminder: We’re defining backstory as all of the background information a writer needs to communicate so that the reader understands each scene. This information might include descriptions of settings, the characters’ past experiences, motives, and psychology, and past events that are not shown on stage. This technique makes us of the Scene and Sequence model, which is frequently discussed in books on writing fiction and on screenwriting. 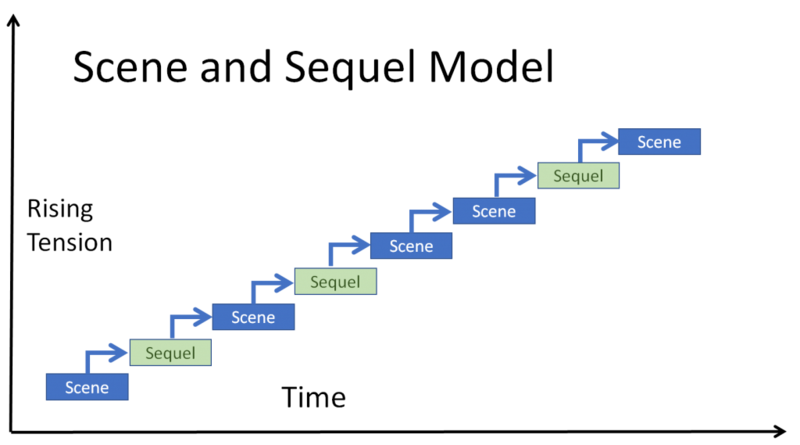 The basic idea is that a story is constructed of scenes and sequels, with rising tension as we go from beginning to end. In this model, a sequel shows a character’s response to the preceding scene and sets the stage for the next scene. A sequel is also a great place to work in some backstory. “Murphy declined to ride in the Blue Beetle, my old Volkswagen bug. The Beetle wasn’t really blue, not anymore. One of the doors had been replaced with a green duplicate, the other one with white, when something with claws had shredded the originals. The hood had been slagged by fire, and my mechanic, Mike, had replaced it with the hood from a red vehicle. The important thing is that the Beetle runs, even if it doesn’t do it very fast, and I’m comfortable with the car. Mike has declared that the VW bug is the easiest car in the world to repair, and so that’s what I drive. He keeps it running eight or nine days in ten. That’s phenomenal. Technology tends to foul up around wizards—flip on a light switch, and it’ll be the time the bulb burns out. Drive past a streetlight and it’ll pick just then to flicker and die. Whatever can go wrong will, automobiles included. What Backstory do we learn here? In typical hard-boiled private eye fashion, he lives on the edge financially. He’s not pretentious in the material sense. He doesn’t need a status symbol car to bolster his ego. His car takes a beating from various monsters. He’s had some interesting cases. And, he is nonchalant about dealings with these supernatural dangers. We also learn that “Technology tends to foul up around wizards.” In Fantasy, the writer has to convey a lot of exposition, because the world is, at least to some degree, different from the everyday real world we all think we know and love. How does the magic work? What are its limitations, drawbacks, and consequences? This passage conveys some of this critical information while describing Harry’s car. One thing more: We not only learn about Dresden’s character, but also Murphy’s—again, indirectly. We learn that, despite the hazards of exposure to a wizard, Murphy is “willing to take her chances” and use her own car. Why? Perhaps she not willing to be seen riding in a beat up old VW. But also—and we are shown this again and again about her character—Murphy is tough and wants to in charge. She wants to drive. So, what looks at first glance like a simple bit of backstory about the character’s car, turns out to convey a lot of information. This illustrates an important principle of good fiction: Everything in the story should be accomplishing several goals. Every passage does double or triple duty: moves the action forward, delineates character, perhaps describes the setting, or explains the background for what goes on. The best-written stories are multi-layered in this way. Next time, we’ll look at the 3rd of our 5 Ways to Show the Backstory: Creating a Scene where a single character reflects. We’re defining backstory as all of the background information a writer needs to communicate so that the reader understands each scene. This information might include descriptions of settings, the characters’ past experiences, motives, and psychology, and past events that are not shown on stage. Following up on last month’s post, here is the first of five ways a writer can convey backstory while maintaining dramatic momentum. This type of narrative can come at the beginning of a story or fitted in between other blocks of story. It can cover a short or long time period. A key element is that it conveys information by showing, not telling, and therefore supports the story’s drama. This dramatic narrative is from a short story by Elizabeth Brown called “Homely Girl.” The passage is quoted in the book Immediate Fiction by Jerry Cleaver (© 2002). It is the opening of the story, leading to a scene of the girl going home as an adult to visit her mother. She’s a homely girl. I don’t know where she gets it,” my six-year-old ears overhear my mother saying to my Aunt Beth. I don’t know what “homely” means, but I know it’s bad. I run to my room, bury my head in my pillow and cry. Eventually, I learn what homely really means. It means to be taken to the dentist for my buckteeth: “Can you make them straighter?” To the plastic surgeon for my nose: “Can you make it smaller?” It means I am dragged to walking classes, talking classes, and posture classes: “Chin up. Shoulders back. Enunciate. Smile.” Homely means that everything I put in my mouth is carefully weighed, measured, and calculated beforehand, so I don’t take up more space than I already do. “Will she ever lose weight, Doctor?” my mother asks. “She’s just a big girl,” says Doctor Chen. Homely means that you see a look of disdain on the face of a mother who wishes her daughter could be a beauty queen. You see that look every day of your life. What does this passage accomplish? What does this passage do for the story? First, it sets up the central conflict between the protagonist and her mother: the daughter’s need for love and acceptance by her parent, the parent’s unwillingness or inability to provide it. Extremely powerful stuff, on a deeply emotional level. Second, it presents crucial information about the two characters, and gives the reader a good idea of who both of them are. 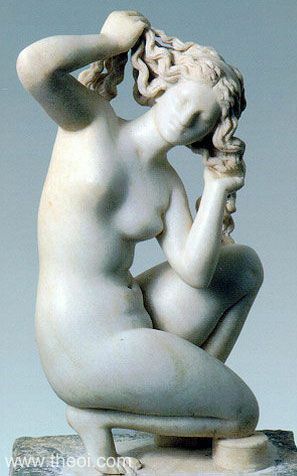 Also, it raises thematic questions: Why is physical beauty considered so important? Why does society judge women (in particular) by their physical appearance? The quoted narrative accomplishes all of this with incredible economy. It spans many years of the character’s life. But it presents crucial events from those years in tiny “micro-scenes,” which are themselves dramatic. That is, they show character, dialogue, conflict, and resolution. All of this in only 177 words! Magic. Again, this technique is to write a narrative summary that sets up the drama in the subsequent scene. To be effective, the summary must show more than it tells. As in the example, the summary may contain snippets of dialogue and micro-scenes. In any case, it embodies the critical elements of drama: conflict and action that are emotional, because they involve critical issues in the characters’ lives. Next time, we’ll look at the 2nd of our 5 Ways to Show the Backstory: using a sequel that connects two scenes.